There is a good chance that your grandparents were born at home. I am going to go ahead and assume they turned out fine, or at least fine enough, since you were eventually born too and are now reading this. But since the late 1960s, very few babies in the United Kingdom or the United States have been born outside of hospitals. As a result, you may find the new guidelines from the UK’s National Institutes for Health and Care Excellence (NICE) just as surprising as I did. For many healthy women, the NICE guidelines authors believe, there may be significant benefits to going back to the way things were. Shortly after the NICE guidelines were issued, the New England Journal of Medicine invited me to write a response. The idea that any pregnant patient might be safer giving birth outside the hospital seemed heretical, at least to an American obstetrician like me. Knowing that no study or guideline is foolproof, I began my task by looking for holes to form a rebuttal. I soon realized that this rebuttal largely hinged on flaws in the American system, not the British one. While we take excellent care of sick patients, we do less well for healthy patients with routine pregnancies – largely in the form of turning to medical interventions more than strictly necessary. As the guidelines suggest, some women in the UK with low-risk pregnancies may be better off staying out of the hospital. Why? Because the significant risks of over-intervention in hospitals, such as unnecessary C-sections, may be far more likely (and therefore more dangerous) for patients than the risks of under-intervention at home or in birth centers. But women in the UK have access to greater range of settings where they can give birth. For women in much of the US, the choice is often the hospital or nothing. The British Birthplace Study, upon which the NICE guidelines are based, reviewed 64,000 low-risk births to compare the relative safety of giving birth in one of four settings: a hospital obstetric unit led by physicians, an “alongside” midwifery-led birth center (on the same site as a hospital obstetric unit), a freestanding midwifery-led birth center, and at home. The study included only women with low-risk pregnancies. Women with obesity, diabetes, hypertension or other medical conditions were excluded from the study. For low-risk women who had never given birth before, home birth led to bad outcomes (such as encephalopathy or stillbirth) slightly less than 1% of the time. That’s rare, but still twice as risky as the other options. Birth centers were no riskier than hospitals for first-time moms, and all options (including home) appeared equally safe for women who had given birth before. By contrast, this same group of low-risk women was between four and eight times more likely to get a C-section if they started off getting their care in the hospital compared to other settings. 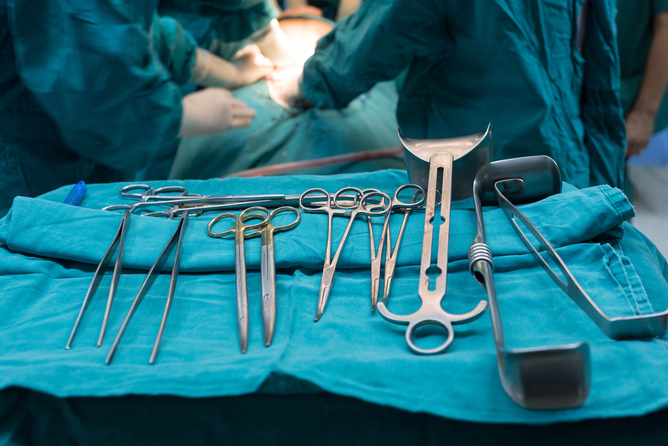 Rather than being driven by patient risk or preference, this tendency toward C-sections appeared to be driven by proximity to the operating room. While the NICE guidelines make it clear that women should be free to choose the birth setting they are most comfortable with, they point out that the risks of over-intervention in the hospital may outweigh the risks of under-intervention at a birth center or at home for the majority of expecting mothers. The situation is different for women in the US. Last year 90% of births were attended by physicians, while just 9% were attended by midwives. Fewer than 1% of US women have their babies at birth centers. While access to care is guaranteed in the UK, nearly half of US counties have no midwife, obstetrician or other maternity care professional. A baby born in the US has a one-in-three chance of being delivered via C-section. 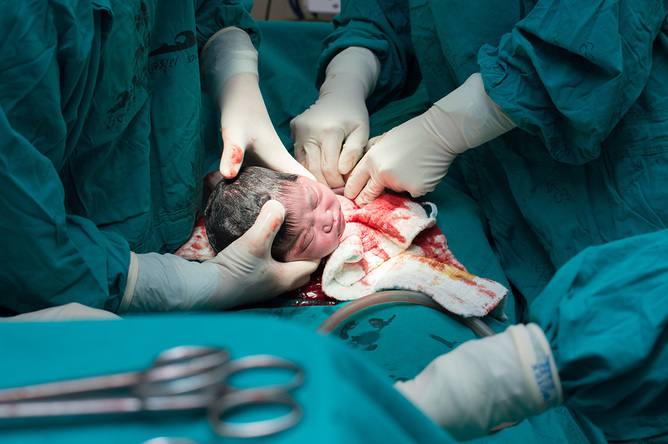 C-section via www.shutterstock.com. Today, newborn babies in the US have a one-in-three chance of entering the world through an abdominal incision. In the UK, the odds are lower – more like one in four, but everyone on both sides of the Atlantic agrees this still represents too much help. Part of the challenge may be a feature of the species. Homo sapiens have always required some form of extra help being born. Narrow pelvises are required for walking upright, and large frontal lobes are required for nuanced thought. Neither works in our favor when it comes to navigating the birth canal. The unresolved question is how much help is truly necessary – and how much help is too much. Cesareans are designed to be a lifesaving surgery, but they are now so routine that C-sections have become the most common major surgery performed on human beings, period. 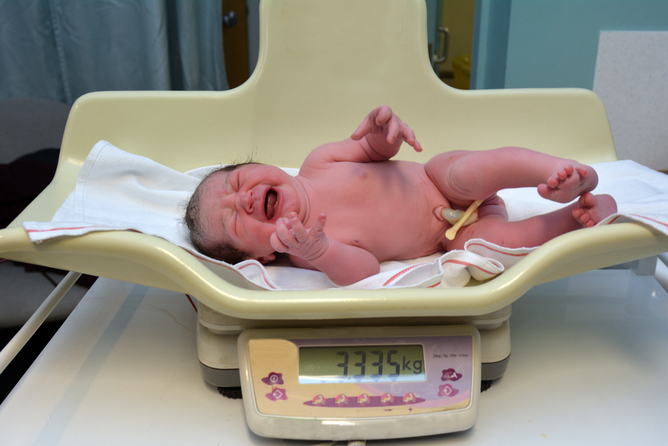 It hasn’t been until recently that we started to fully consider the downsides of cesarean deliveries. For starters, caring for a newborn while dealing with a 12-centimeter skin incision in your own abdomen is the pits, especially when compared to caring for a newborn without having a 12-centimeter skin incision. Though common, let’s not forget that C-sections are a major abdominal surgery that can lead to threefold higher rates of serious complications for mothers compared to vaginal delivery (2.7% vs 0.9%). These complications can include severe infection, organ injury and hemorrhage. I should also point out that the first C-section a woman has is an easy surgery – I can train an intern to do one safely in just a few weeks. But most women have more than one child, and most women who have a C-section the first time will have a C-section the next time. Obstetricians are among a small group of surgeons who regularly operate on the same part of the same patient over and over again, dissecting thicker layers of old scar tissue with each surgery. By the second, third, or fourth C-section on the same patient, the anatomy becomes distorted and the surgery becomes increasingly technical. I recently did a cesarean where the woman’s abdominal muscles, bladder and uterus were fused together like a melted box of crayons. In the most dreaded cases, a woman’s placenta (a large bag of blood vessels that nourishes the fetus) can get stuck in this mess of tissue and fail to detach normally. In these cases, pints of blood may be lost within minutes, and the only way to stop the bleeding is often to do a hysterectomy. C-sections are 500% more common in the US today than in the 1970s. Baby via www.shutterstock.com. Since 1970, the number of C-sections performed in the US has gone up by 500%. Some of this increase is because mothers have become older and less healthy, conferring greater risks in pregnancy. But having a baby in this decade is not 500% riskier than having a baby in the 1970s. We know this because C-sections rates in just the women who are young and perfectly healthy have gone up just as quickly. And contrary to popular belief, this has little to do with maternal preferences. First-time mothers who request C-sections with no medical reason make up fewer than 1% of the total. What’s driving the increase in C-sections in the US is unclear, but much of the drive to do more comes from our perception of risk. Although my professional contribution to childbirth is often just to catch, my responsibility as a scalpel-trained, general obstetrician in the United States is to mitigate risk. I am acutely aware that even women with healthy pregnancies can develop life-threatening hemorrhage, fetal distress or other unanticipated emergencies during labor that require surgical intervention. My job is to get the baby delivered before it is too late, and often I’m working with ambiguous information. I know how long labor should take on average, but don’t have a precise estimate of how long labor should take for the patient in front of me. What if the baby is too big or the pelvis is too narrow? C-sections often come down to a game-time decision. Fortunately, I can make sure this decision is never wrong. If the baby looks a little blue and lackluster right after I do a C-section, I’m convinced I did it just in time. But if the baby is pink and vigorous after I do a C-section, I’m still convinced I did it just in time. Without evidence to the contrary, it is easy for me and many of my colleagues to believe that operating is always the right course of action. When it comes to safety, it’s better to overshoot. Baby via www.shutterstock.com. When it comes to the safety of mothers and newborns, most would agree that it is better to overshoot than undershoot. The problem is that we are overshooting by a lot, in ways that lead to more insidious harm. Nearly half of the cesareans we do in the US currently appear to be unnecessary, and come at a cost of 20,000 avoidable surgical complications and US$5 billion of budget-busting spending in the US annually. C-sections may have consequences for babies as well, in ways that we are just beginning to understand. Exposure to normal bacteria in the birth canal may play a role in the development of a baby’s immune system. A Danish study of two million children born at full term found that those born by cesarean were significantly more likely to develop chronic immune disorders. Others have suggested that going from the womb to an artificial warmer can have an impact on immediate bonding, and even success with breastfeeding. In parts of the world where women do not have access to skilled birth attendants, large numbers of mothers and babies die from preventable causes. Even for the healthiest among us, walking into the woods to have your baby would be unwise. Still, much of the developed world offers only one pragmatic alternative: the hospital. For more than a half-century, we have believed that spending many hours, if not days, in a hospital bed with a smattering of ultrasound gel, clips, wires, heart tones, random beeps and routine alarms is the safest way to have a baby. Many of the patients I care for benefit from my surgical training. I get to save lives while also sharing in one of the most profoundly joyous moments that families experience. But obstetricians like me may be hardwired to operate, and too many operations are harmful to patients. One strategy to fix this might be to change our wiring. Another may be the British way: for patients to stay away from obstetricians altogether – at least until you need one. Should Academic Departments Be Child Friendly? Dr. Neel Shah, MD, MPP is an Assistant Professor at Harvard Medical School and associate faculty at the Ariadne Labs for Health Systems Innovation. His work broadly aims to help clinicians make decisions that lead to safe, affordable, patient-centered care. As an obstetrician-gynecologist at Beth Israel Deaconess Medical Center, Dr. Shah cares for patients from childbirth through menopause and practices both primary care and surgery. In addition, he is the Founder and Executive Director of Costs of Care, a nationally recognized nonprofit that curates insights from clinicians to help delivery systems provide better care at lower cost. He has been listed among the "40 smartest people in health care" by the Becker's Hospital Review, and profiled in the New York Times, the New England Journal of Medicine, and other outlets for his efforts to expose how low value care can harm patients. Dr. Shah completed residency at Brigham & Women's Hospital and received degrees in medicine and public policy from Brown Medical School and the Harvard Kennedy School of Government. He is co-author of the textbook Understanding Value-Based Healthcare (McGraw-Hill), a series editor at JAMA Internal Medicine, and former co-chair of the Institute for Healthcare Improvement National Forum. I wonder if much of this ultimately comes down to how well obstetricians really know their patients. When my wife was nearly ready to deliver our twins, we were sent to a hospital we had never been to before, where her doctors didn’t practice. The doctors she saw there basically told her that because of her situation (the twins were several weeks early) she would attempt to deliver in the OR and they would intervene at the first sign of trouble. complications, but the second had issues and they had to rush to the OR. Once there, they still didn’t immediately operate because as the doctor later said, she knew my wife and wanted to give her every opportunity to avoid a C-section – which, in the end, she did.